Before we start all of our skin care therapies, we make a full skin analysis of our guests and inform them on the best skin products suitable to them and how they should apply and use them. 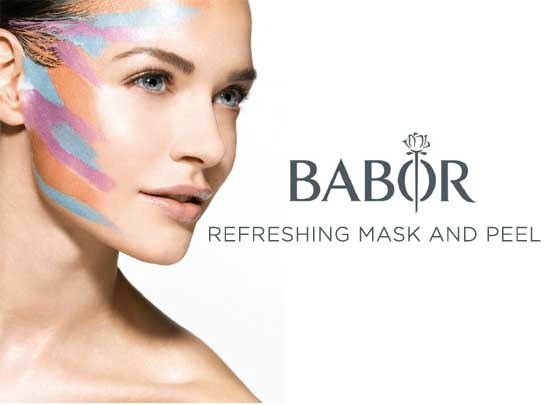 The German brand “Babor” which has received many awards in the world is used by our Spa for skin and body care. Treat yourself to this unique skincare experience. Skin cells lose the ability to divide over the years until they die altogether, resulting in wrinkles and other signs of aging. This Facial Care extends the life of skin cells and actually slows the aging process for beautiful results. The skin ages slower and keeps its youthful and elastic look longer. Reduces fine lines and wrinkles. Intensively firms the skin. 110 min. Our facial expressions are what make us unique. But they also leave their traces. Over time, every laugh, every wink or frown causes micro tensions in the skin. The result is expression lines. Protects your skin against ageing and is therefore the ideal bodyguard for your skin. The skin regains its youthful appearance, expression lines are smoothed, visibly minimizes the depth of wrinkles. 80 min. Achieves a balancing act, providing gentle and sensitive yet thorough and effective care for your skin thanks to the natural ingredients it contains, which are tailored exactly to the needs of all skin types. These have a regulating effect on the skin flora and thus combat impurities in the skin, giving the skin structure a visibly refined appearance. 80 min. This mask is applied on your face with a special mud, featuring in rich minerals. It nourishes your skin, thanks to its rich content. Enables you to have a brighter appearance.10 min. Natural facial expressions and many environmental factors take their daily toll on the eye area, which is the most delicate part of the face. This treatment protects the beauty around the eyes. Meets all requirements for radiant, beautiful and attractive looks 30 min. Whether at work or in your private life a well groomed appearance is becoming more important in today’s world. The sleek facial care and fragrance range with a fresh, tangy note for the sophisticated, sporty and elegant man. These have a regulating effect on the skin flora and thus combat impurities in the skin, giving the skin structure a visibly refined appearance. 60 min. Stress, fatigue and tension also take their toll on your skin and it shows. Complexes C, the vitamins C, A and E specially encapsulated in multivitaspheres have a cumulative effect and are gradually released into the skin. Gives the skin a healthy and vibrant appearance. 70 min. Every woman is different, and so is her skin. Having a daily skin care regimen tailored to the various needs of your skin is essential to maintain your own unique beauty. A personalized skin care system is customized for every skin type – for beautiful and lasting radiance. 60 min. First your body is encased completely with Thalgo Seaweed. The body is made to sweat and this pores are opened with the perfect composition of steam and infrared heat, enabling the penetration of seaweed into the skin to be accelerated. After this treatment a 360 degree Rain Shower experience will dispose the toxins from the body and accelerate blood circulation.60 min. Enjoy the emotional relaxation combined with cleaning. Improves elasticity, banishes tiredness. 30 min. Seaweed is known for centuries as a healing power tool and is used as a natural skin care. During this therapy a special heated blanket is wrapped around your body which slims and tightens your skin. Your whole body relaxes cocooned in this warmth.35 min. Dead cells in the skin are cleansed by massaging the whole body with aromatic oils and softened sea salt. Blood circulation accelerates, the skin gains minerals. This care enables your skin to look smooth, soft and silky. 30 min. A Gold mask containing atomized gold powder that generates a golden shiny look on the skin. When the peeling is applied, it remoives dead skin and allows the aroma as well as our essential oils to penetrate subcutaneously.30 min. This mask is applied throughout your body with a special mud, featuring in rich minerals. It is used for loose skin and for weight loss. It nourishes your skin, thanks to its rich content. Enables you to have a smoother, brighter appearance. 30 min.